Climbing above the sea is an unique experience that adds an extra edge to rock routes; once experienced it is hard to avoid the allure of sea cliffs and crags such as Gogarth and Pembroke in Wales will drag you back time after time. Sea cliff climbing can feel more intimidating and is often more committing, but once the extra skills and confidence needed are mastered, the rewards and memories gained from climbing them are all the greater. A few simple actions could make the difference between having a great day above the sea and suffering an epic. 1. Take a couple of prusic loops of a diameter suitable for the ropes you are using - 5mm bites pretty well on half ropes and most modern single ropes, but some people prefer 6mm prusics. Prusics are pretty invaluable if you abseil down to find you have left your climbing ropes at the top of the crag or if you fall into space when on the route. 2. Know how to use the prusics. The standard prusic knot has been pretty much superseded by the Klemheist prusic now because it can be released under load. The French prusic is also commonly used by climbers and can also be released under load, although it does have a tendency to lose shape/release a bit too easily. Too many turns on the prussic can be a real pain - normally 4 loops works well, but this depends on the diameters/condition of ropes + prussics being used. 3. If you do have to prusic then tying back into the rope that you are ascending every few metres is the safe option i.e. every 5 - 15m pull up some of the rope that is below you, tie an overhand knot in it and clip the knot into the belay loop of your harness with a locking carabiner. 5. There's no point in having your prusics and nothing to use them on, so leave your abseil rope in place if at all possible. 6. Choose the line of your abseil carefully and always protect the abseil rope. Abseiling and jumaring can impart a bouncing motion to the rope that can cause sharp rocks and edges to chew through the rope. 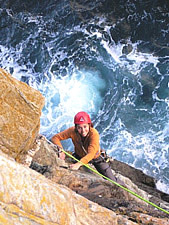 Always take care when moving sideways on the abseil ropes; sea cliffs often contain more than their fair share of loose rock and swinging around to reach the belay stance can dislodge rocks and other debris. Slow and smooth is the key. 6. Don't leave any excess abseil rope on the ground if there is any chance that the sea can reach it - once in the sea abseil ropes quickly get wrapped around rocks and often become irretrievable. The sea has a long reach especially when there is a big swell running. The Rock Climbing Company offers high quality mountaineering and climbing instruction that covers all the traditional mountain skills such as rock climbing, scrambling and navigation. We can deliver these courses at all levels of ability and experience. Disclaimer : Although we've tried to make the information on this web site as accurate as possible, we accept no responsibility for any loss, injury or damage sustained by any person resulting from information published on this site. Remember that Outdoor Sports can be dangerous and unpredictable.